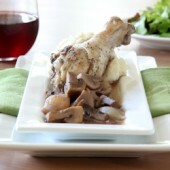 Julia Child’s Coq Au Vin recipe; Slow braised chicken with a flavorful red wine sauce and tender mushrooms. Serve over potatoes or rice, with a fresh green salad. I should’ve known I’d be at one point cooking with wine this summer. I suspect after having two recipes so far with liquor in them, I should stock up or maybe get familiar with the liquor store hours. Thankfully my grocery store carries wine so I was off the hook with the scary alternative… eh hem… taking an 8 month old and a crazy 2 1/2 year old that is in a bit of an independent stage (i.e. no I don’t want to hold your hand or go where you want me to go) into a store full of breakables. Yeah, I don’t think so. That’s a disaster waiting to happen. There should really be drive up liquor stores for times like that. It’s a cooking emergency, I swear! I ventured off course a bit with this one. I looked to do some video research again. I’m a visual learner, I can’t help it. I had no such luck in finding a Julia Child video but Alton Brown came to the rescue. So my method was a bit blended between the two masters. While Julia recommends using a ‘young red wine (zinfandel, chianti or macon)’ Alton recommended pinot noir and preferably sticking with one from France, where the recipe originates. I liked the sound of that. You should be able to easily find a French bottle of pinot noir for between $10-20. No need to go crazy but if you prefer a pricier bottle then by all means. You should cook with a bottle that you like drinking. You’ll need a good portion of a bottle of wine for the recipe. So, if you’re planning on drinking more than a glass or two plan on getting two bottles. It never hurts to have extra on hand. Another difference between methods is Julia has you simmer the recipe immediately but does give the option for sitting until you’re ready to eat. Alton suggested allowing the food to sit overnight, giving the flavors a chance to mingle. This method suited me more simply because the prep time for this recipe is already fairly extensive and I’m on limited time some days. This method also allowed for me to get pictures! Yesterday was grey and rainy. By the time I was done prepping, it was dark or getting there. I’d have had zero chance at getting any pictures for you. 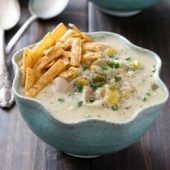 What’s a food/recipe post without pictures?! I eat with my eyes, as I’m sure you may do too! My best suggestion would be – let it sit or don’t, it’s completely your call. If you have the time to cook immediately then have at it. If you are on limited time, do the prep work and let it sit until you can cook it. But be sure to cook it within a day. 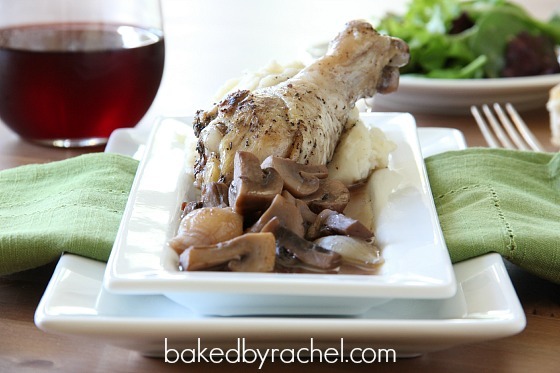 Slow braised chicken with a flavorful red wine sauce and tender mushrooms. Serve over potatoes or rice, with a fresh side salad. And don’t forget a glass of wine! To a large oven safe stock pot or Dutch oven, add garlic, celery, carrots and thyme. Bring 2-3 cups of water to a rolling boil in a small sauce pan. Cut off the root ends of the pearl onions. With a sharp knife, mark an 'x' in the cut end. Add onions to boiling water for 1 minute. Drain and cool. When cool enough to touch. Simply squeeze on the top of each onion. The skin should want to slide right off. Set onions aside. Cut bacon or pork into thick 1/4" pieces. In a large skillet over medium heat, add bacon and 2 tbsp water. Cool until almost crisp (8-10 minutes). Remove bacon and set aside. In the same pan sauté onions until browned (8-10 minutes). Transfer to a clean bowl or container. Add chicken to your Dutch oven. Brown chicken over medium heat with 1 tbsp butter or olive oil if necessary, 4-5 minutes per side. Season with salt and pepper. Add quartered mushrooms to the skillet with 1 tbsp butter. Season with salt and pepper if desired. Sauté for 5-10 minutes or until tender. Transfer mushrooms, bacon and pearl onions to a storage container to chill overnight or set aside until ready to cook the chicken. If your pan needs deglazing, add 1 cup wine to loosen bits. Add contents to Dutch oven along with remaining 2 cups red wine, chicken stock and bay leaf. Chill overnight or skip to next step. Place Dutch oven in oven, set to 325 degrees. Simmer for 1 - 1 1/2 hours or until meat registers at least 165 at the thickest portion. Mine took just about an hour. Transfer chicken to a heat safe container or form a foil pouch. Turn off oven, and add chicken back to the oven to rest. Strain sauce into a sauce pan through a colander, discarding vegetables. Cook over medium heat until reduced by 1/3, 20-45 minutes depending on how much liquid you started out with. Once reduced and thickened, add mushroom mixture and cook for 15 minutes more. Plate your chicken, pour mushroom mixture over. Serve with potatoes or white rice and a fresh green salad. I like your comparision between Julia’s and Alton’s methods. 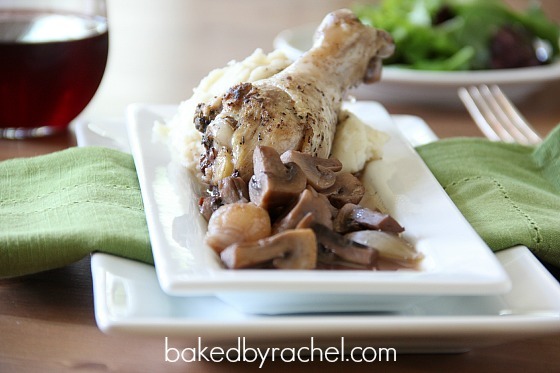 I didn’t know what coq au vin was until this post, it looks delicious! I have that cookbook by Julia Child and love it. 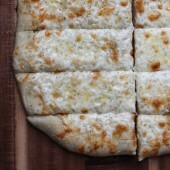 We’ve made her calzone recipe a couple of times and love it. I used Pinot Noir too and loved it! To me, this sounds like the comfort meal. I’m sure the flavors are absolutely fantastic! 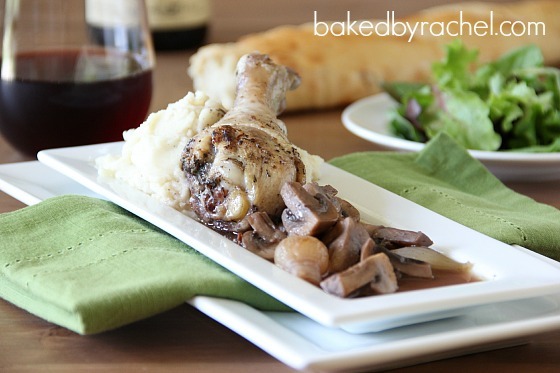 I adore coq au vin and this looks incredible. Beautiful…comfort food at its best!! Jealous you can get alcohol in your grocery store, that’s not an option here. We have good wine in our grocery too! :) This looks great Rachel! I really want to dive in!! I’ve always, always, always wanted to make coq au vin but was worried about the time commitment. 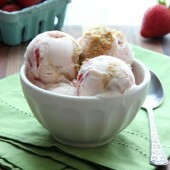 I’m making it SOON and then probably again when the husband comes home. It looks so good! We had a French exchange student years ago and she made this for us. Will never forget it. Yum! Love your photos. Anything that pairs well with Pinot is good enough for me! Haha. This looks great though! This looks lovely! I haven’t made it in some time but I remember when I did it smells amazing when its cooking. You have inspired me to make this again soon! 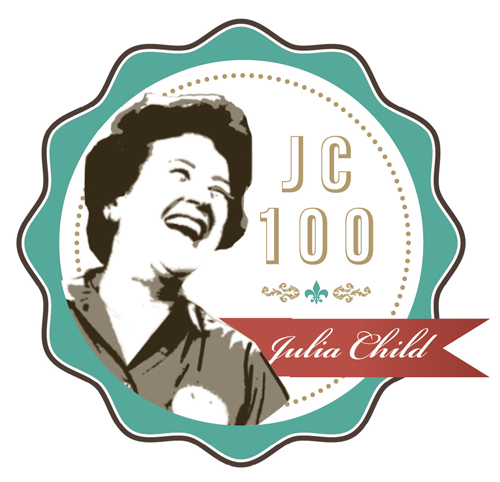 This looks heavenly – Cheers and here’s to JC100! Is there anything better? Julia is a dream! Coq au vin has been on my bucket list for a really long time but I’m so intimidated cooking with liquor, mainly because I don’t drink. But your tips are incredibly helpful. I’ll have to try this soon!